The explanation that follows is, like any other, a pathway of understanding. The form that this explanation takes, however, is different to any other that I am aware of in the presentation of the concepts that constitute it. They are all plainly stated in their most simple and unambiguous form, and are employed in this form throughout the Explanation without the distraction of any inessential text. These concepts constitute the steps on a pathway of understanding that takes the reader from conceptual terrain with which they may be familiar and leads them into and through a realm of contemplative thought with which they will probably not be familiar. These steps are arranged in logical sequence in a series of deductive passages that lead ultimately to the concluding statement that is the focal point of this website. The deductive passages are divided into seven numbered parts. This division does not indicate any discontinuity in the Explanation and is included only to facilitate a thorough critical analysis of it. The Explanation was written, and should be read, as a single, continuous whole. Each of the seven parts of the Explanation is divided into passages within which each line stands alone as a discrete conceptual and contemplative step. The only exception to this rule is in the first two lines of the second passage where one particularly important premise is presented in two complementary forms with identical meanings. The purpose of this duplication is to emphasise the importance of this premise and to maximise its understanding, because its importance in the Explanation really cannot be overstated. Several of the passages are sub-divided into two or more sections, which arrangement reflects my experience of those sections as discrete contemplative steps within that passage. In the Explanation I have taken as true a number of theological, cosmogonic, ontological and epistemological premises, all of which are well attested in Judaism even if not universally agreed upon. These are the primary premises upon which the Explanation is based and upon which its validity stands. They feature most prominently in the earlier passages, but are found in various places throughout. Each passage reaches an interim conclusion that is separated and in bold type and which may feature thereafter as a premise in its own right. A summary of the Explanation that is comprised mostly of these interim conclusions follows on the completed Explanation. The purpose of the Summary is to assist in understanding the Explanation and confirming its validity, and to serve as a companion to the Diagram, which is described below. The method I have employed in the Explanation is one that occurred to me only as I began this undertaking and as far as I am aware has no precedent in theological or philosophical enquiry. I could not then and cannot now think of a better way to convey the understandings that the Explanation contains. However, aside from it being the method best suited to my purpose, I believe it is also the format that readers will find easiest to follow and most useful for confirming the validity of the Explanation. The Diagram depicts my understanding of the creative activity of God. It is the schematic counterpart to the Explanation and provides the reader with the most readily grasped schematic representation of what is set out in detail in the Explanation. 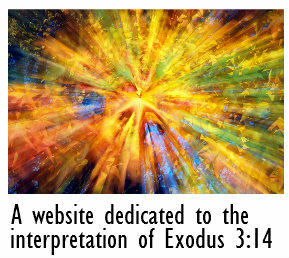 It places the Divine name Ehyeh of Exodus 3:14 in its Jewish context by employing the concepts intrinsic to Jewish thought and by reference to the Torah. I must emphasise that the Diagram is not a schematic representation of God, but only my understanding of His activity as Creator. The Explanation is certainly an appeal to faith, because Mosaic Monotheism (i.e. the monotheism of Moses) is assumed from the outset, but it is even more so an appeal to reason, and to the reader’s willingness to ponder and imagine ideas that they will not have pondered before.